We primarily import to Mexico and distribute nationwide. With time, we have found the best suppliers in the producing countries of black pepper, allowing us to maintain high quality and competitive prices. With continued growth we now sell from country of origin to other countries. “Piper nigrum” (its scientific name) is a climbing bush from the Piperaceas family, cultivated for its fruit, consumed dry as a spice. The plant can grow to 10 meters tall. Its small flowers are white and greenish yellow. The flower clusters grow from the stems on the opposite side of the leaves and produce tight groups of berries which change from green to red when mature. Each cluster contains from 50 to 150 flowers, producing about 50 fruits. The fruit is a berry, about 5mm in diameter that contains a seed. The tropical plant “piper nigrum” comes from India (specifically the state of Kerala) and Java (Indonesia). India continues to be the largest producer in the world. 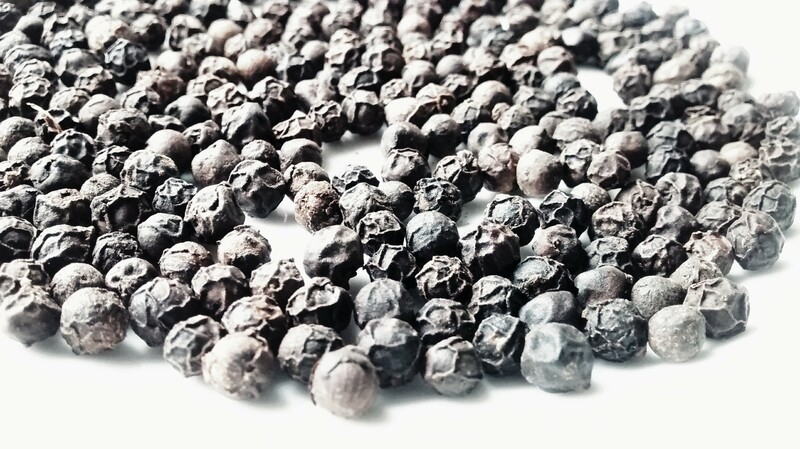 Black pepper is native to the state of Kerala in India, where is still grows wild in the mountains. Through the migration of Hindu colonies the pepper plant was introduced to Indonesia and other South Asian countries, from where pepper has been exported for over 4000 years. There are historical references to it dating back to the first four centuries B.C., where it is mentioned in the literature of Tamil, describing banquets offering dishes seasoned with black pepper. Ancient medical documents prove that traditional medicines often contained pepper. Pepper was introduced to Greece by Alexander the Great. The Arabs controlled the commercialization of pepper and other spices for centuries, but after the fall of the Byzantine Empire, Venice took control. Pepper was such a rare and valuable product in the Middle Ages, that it was used as money. Its high value was one of the reasons that the Portuguese (the explorer Vasco da Gama, 1498) searched for the route to “the Spice Islands” in the Orient, sailing around Africa. Soon other European countries established similar commercial routes. In these times pepper was used to preserve and season foods, especially meats. The small climbing plants grow with the support of wood trellises. After 3 years and a height of 2 meters, they begin to produce. When the fruit is mature, but still green, the stems are picked by hand up to 8 times per fortnight, all year round. They are fermented overnight and are then laid out in the sun to dry for 4 to 5 days, being turned periodically. With a commercial dryer this process can be cut to just 7 hours. The drying process makes the pepper corns fall from their stems and wrinkle. While black, green and white pepper come from the same plant, black pepper is distinct for its hot, spicy flavor and its unique aroma. Its “heat” is due to its piperine content, which is found in the shell and seed. Its aroma is a combination of flowers, wood and critics, born of its odorous terpenes, found in its shell. White pepper does not have these qualities because its shell is removed. To preserve the flavor and aroma of black pepper it is important to store it in a dark and dry place. It is also recommended to grind just before use, to avoid the evaporation of its aromatic qualities. Kitchen: Black pepper is one of the most popular and widely used condiments throughout the world. Meats, sauces, stews as well as pickled food are prepared with this divine spice. To conserve its flavor and aroma, it is recommended to store it in a dark and dry place. Grind it just before consuming. Medicine The original herbalists were the predecessors of the actual pharmacists. Since traditional Indian medicine, black pepper is still applied to cure various ailments. Commonly, it is used to treat digestive problems and to eliminate intestinal worms. Piperine (one of its alkaloids) is proven to have anti-inflammatory and sedative properties that can relieve pain and lower fever. Thus, black pepper is used in medicines to cure tooth pain (in tooth paste), cholera and syphilis. It also alleviates throat pain, respiratory and heart problems because it improves blood circulation. Furthermore, it is an ingredient in some topical medications to prevent hair loss, to treat skin and eye conditions, coma patients, hepatitis, urinary tract dysfunctions and reproductive problems.